i'm trying to drive a 5 volt 74LS02 and i have some trouble on how to. if i put a signal onto the Base via J1, i can measure the input signal at the Base on the Collector but nothing at the Emitter "with R2 removed". i'm trying to prevent the input signal to leak back onto the 78L05 and everything along the 5 volt line. infecting everything. also the 74LS02 stops working if you connect pin 7 to GND, if you remove it, it seams to work. what has to be done here? Where are you connecting the emitter? Normally with this kind of circuit you'd connect the emitter of Q1 to ground, and take the output from the collector. Is that what you have in mind? Assuming you do that, the output will be inverted: 5V when the input is low, about 0.3V when the input is high. There is no real concern of the input signal "infecting" the power. If R1 is appropriately sized, the input voltage can go as high as you want, because the transistor is responding to current, not voltage, and clamps its base to no more than about 0.7V as long as the current is within reason. Most transistors can handle far more current this way than they require to turn on, so it should be possible to design the input resistor to give you plenty of safety margin. A sufficiently large negative input voltage could be a problem (driving the transistor into breakdown) and you can protect against that with a diode from emitter to base on the transistor. wel, i'm triyng the actuate a 74LS02 ic, so the emitter is connected to one of the input pins. so there are actually 2 transistors to combine a "AND" state. i'm also trying to find out what size of resistors i need, i tried a few, 220R, 1K, 10K. while aiming to have a steady 5 volt on the power line. i'm trying to convert a 10vpp into 5volt positive. so i need to put a diode after R1 in series or? That's not going to work. The transistor will bring its emitter to about 0.7V below the input at its base, so if you put in input that is over 5.7V, then you're going to be putting an overvoltage on the 74LS02 inputs. Effects on the +5V bus are not really the main problem. If you're okay with having the signal inverted, it would be sensible to do like I described, with the emitter to ground and output taken from the collector. If not okay with having it inverted, you could consider a different circuit with a Zener diode instead of a transistor - Zener voltage something like 4.7V, high-voltage input through a resistor to the Zener cathode, Zener cathode to the 74LS02 input, Zener anode to ground. 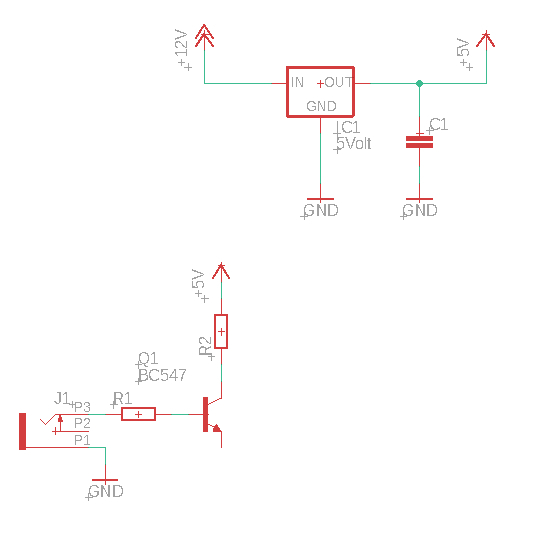 There's no point looking at resistor values until you have a circuit topology that works. It'd probably help to draw a schematic of the entire setup - including all transistors if you're planning more than one, where you're putting in the input, the connection to the 74LS02, and so on. Note that the inputs to a 74LS02 are pulled high internally so if you drive it with a circuit that can only drive the input high, it will always be high. For your circuit to work, you need to add a pull-down resistor no more than 2kohm at the input to ground. This will give a 0.8V drop across the resistor when the input current is 0.4mA, the maximum value according to the datasheet. thnx, after you mentioned about transistors are controlled by current a video on youtube popped up. i guess math is required in order to control the trannie, i'm using a 2SC945. i might have burned them without knowing, because i used a 220R in front of the base. thnx a lot, that is very useful info. i steel need to figure out, when i connect pin 7 to the ground, closing the circuit, the output goes high and that's it. i did get the 74ls02 to work sometimes, but without the GND wire connected to pin 7.
while i fried a 78L05 .... regulator, i had some weird brand 74ls02's, now some T.I. 74ls02 have arrived. ... and i think, my home imporvement multi-meter accuracy looks inacurate.